Last night was the AGM of the Caernarvonshire and Anglesey Caledonian Society. It was a nice short meeting, at just under 30 minutes (which left plenty of time for dancing later in the evening) and, as expected, I was re-elected as chairman for another year. As chairmanships go, this one is a bit of a sinecure. Apart from chairing the AGM (and any meeting which allows itself to be finished in less than half an hour can’t be too bad! ), pretty much the only duties involve welcoming people to our two annual dance events and introducing the speakers at our Burns Night (this year was unusual as I was one of the speakers – I was introduced by our secretary, rather than having to introduce myself). Since yesterday, I’ve been re-exploring the “radio” facilities of last.fm, which I have occasionally used in the past but not for quite a while. Now that spotify imposes significant restrictions on the amount of streaming music you can listen to in a week (at least with a free account), this facility becomes increasingly attractive as a means of exploring music beyond what’s in my own collection. There are several forms of radio offered by last.fm through their website. As far as I’m aware, you need to have an account there to be able to use any of them (I believe accounts are still free). Apparently there are limitations as to how much you can listen to in some countries, but here in the UK the last.fm radio is free, at least for now. Each radio station is based on some kind of theme, which could be artists (or it may be tracks) in your library (or somebody else’s – I think you can listen to any user’s library radio), tracks having a specific tag (users are able to put whatever tags they like on music, and I assume that the tag radio looks for all tracks that anyone has given the specified tag; I’ve not really used that particular approach to the radio yet), or tracks recommended for you (by last.fm, presumably based on what you’ve been listening to recently). There’s also artist radio, which looks for tracks by artists similar to the one you specify (I’m not sure quite how they decide on similarity, but it usually seems to give quite a good match and sometimes turns up unexpected gems). One form of radio station which I’ve found to give surprising and, generally, somewhat disappointing results is the member radio stations based on the last.fm groups you belong to. There are groups for all kinds of things, some music-related and some not really. Amongst the groups I’m in, there’s one for Ubuntu Linux users (although I’ve actually been using different Linux flavours for the past several years), one for Nordic folk music, one for banjo players and one dedicated to the Welsh singer-songwriter Fflur Dafydd (I discovered that one last week and became its second member – the founder is evidently based in Poland but seems to speak quite fluent Welsh). Rather than the member radio stations playing tracks that are specifically connected to the group interest, they play tracks drawn randomly from the libraries of the group members. That in itself can be quite interesting but it means that if you go to, say, the Nordic folk group radio looking for Nordic folk music you’re likely to be sorely disappointed (on the assumption that most of the group members will also listen to lots of other stuff). Still, it’s not a great disaster since the artist and tag radio stations can be used to get at the more specific connections. Like real radio stations (ignoring request shows) you don’t get any say on the actual tracks that are played beyond choosing which station to listen to in the first place. However, you can pause the playback at any point and come back to it, so you don’t have to miss a particularly good track if you need to stop to answer the phone (or a call of nature). You can also skip a track if you don’t like it (you can’t skip backwards to replay a track, presumably due to licensing restrictions, and you can’t navigate within a track). Of course, the tracks you listen to on the radio also get scrobbled to your account. I think I’ll definitely be making more use of these facilities in the coming months. Last night’s Iolanthe rehearsal was fun, because we had our first look at the costumes we’ll be wearing. For the peers (I am one), this consists of a heavy cloak (which feels like it’s made from an old curtain and weighs about half a tonne) and a coronet (as well as black trousers and a white shirt – but we’ll be providing those ourselves and probably not bothering with them until the dress rehearsal). Rather than just seeing the costumes and trying them on, we wore them for the rehearsal as this gives us a chance to get used to moving in them. Some of the moves, such as sweeping the cloak to accompany singing the words “bow, bow, ye lower middle classes” (one of my favourite lines in the chorus part, despite my egalitarian leanings), can’t really be done without the costumes and it’s also useful to know what movements we can’t achieve while wearing them. Those of us who remembered also brought the shoes we’ll be wearing for the performance, as one of the more seasoned actors within the company recommended this as being an excellent way of helping you to get into character. It’s also useful, as with wearing the cloaks or other parts of the costumes (probably less of an issue for the fairies with their wings, but certainly applicable to their wands), for establishing what is and isn’t possible when dressed for the part. Initially, I must confess, I was somewhat sceptical about the value of wearing my performance shoes during a rehearsal but when I actually tried it I found that the combination of the shoes and the cloak did help me to get into the character of a rather proud and condescending upper-class twit that the role calls for. There’s only about a month now until the show itself (28th to 31st March) and the growing awareness of our increasingly limited rehearsal time seems to be doing wonders for everyone’s concentration. I think it will indeed be alright on the night. As I mentioned the other day, I’m quite partial to chocolate-coated ginger so I decided to have a go at making some with the crystallised ginger I picked up recently. Deliberately flouting the first rule of cooking (well, one of the rules anyway: always use the best ingredients you can afford), I picked up a bar of the cheapest dark chocolate I could find – Morrisons economy label; I was shocked to note that it’s gone up 50% since I last got a bar a few months ago and now costs a whopping 30p instead of 20p, but it’s still far cheaper than any of the competition and is respectably good chocolate for the price and certainly good enough for my experimentation. Being unsure as to how best to melt chocolate and too impatient to google it, I just put about half the bar in to my smallest saucepan at a very low heat, stirring it with a wooden spoon to try and prevent it burning. This was only partially successful and I ended up adding a small amount of milk to try and make it a bit smoother. I then dropped in bits of ginger, one or two at a time, and gave them a good stir round to get them well-coated before taking them out and dropping them on a plate. The added milk seems to have made the chocolate set quite soft, but the finished pieces are very tasty. To use up the remaining chocolate and go some way towards cleaning the pan, I added a fairly generous amount of milk, a little bit of sugar, some ground cinnamon and a pinch of salt while it was still on the heat, then let it simmer for a bit and decanted it into a cup to enjoy as a drink of hot chocolate. This was a bit richer than the usual stuff I make up from powder and, although probably not the way I’d want to make it every time, has potential for being an excellent way to make it up as a special treat (I was inspired by a recipe I’d looked at for DIY hot chocolate that suggested adding cream too; that one started with heating the milk (and sugar?) then adding the chocolate and other ingredients but was otherwise much the same as my method) and it does seem to be a good way of using up any remaining chocolate after dipping operations. I think, though I haven’t yet done any research or experimentation to check this, that using a double saucepan or bain-marie (as far as I know that’s just another name for the same thing) is the preferred method for melting chocolate, as it provides a much gentler heat. I’ve got nearly half a bar of chocolate and a fair bit of ginger left over, so if I can find suitable pots to use, I might give that a try to see if it works better. If you know me well and you have been perceptive enough to spot that many of my blog posts have been published around 7am, you may be wondering how I have managed to be up and writing semi-coherently at that time of day. The answer is not (sadly) that I’ve got access to a time machine or an IV caffeine drip to wake me up bright and early in the morning but that I often make use of the scheduling feature offered by WordPress. That is, rather than publish my bloggings immediately, I line them up ready to be published at a specified future time (I haven’t tried scheduling a post for a specified past time, but I suspect it would publish immediately and list the publication date as specified). The principle reason for doing this is that I often get inspiration for several blog posts at once, but I prefer to spread the posts out a bit. Also, potentially it gives me a chance to review what I’ve written before my random thoughts get unleashed on the world. For both these purposes, rather than saving a post as a draft and having to remember to go back and publish it later, it’s convenient just to schedule it for future publication. 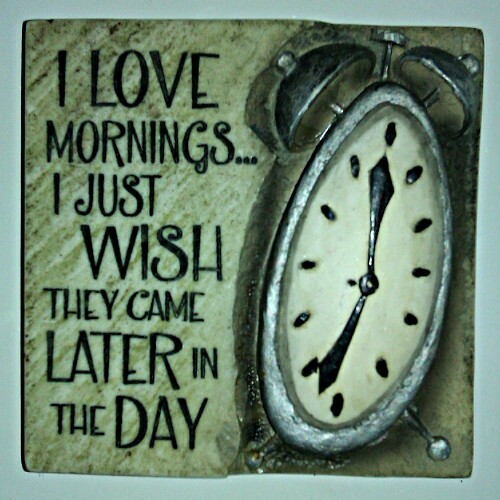 In case you’ve never had the pleasure of encountering me first thing in the morning, my feelings about the first part of the day are probably best summed up in the words of a fridge magnet that my boss gave me as a birthday present a few years ago: “I love mornings… I just wish they came later in the day”.